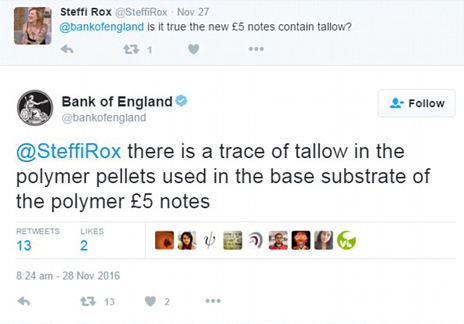 If you haven’t already heard, the UK’s new £5 note contains Tallow. Tallow is a substance usually rendered from cow’s fat and can be found in candles as well. Recently there has been a mass outcry from many different communities within the UK opposing the use of animal fat in the new five pounds notes. These communities include Sikhs, Hindus, Vegetarians and Vegans and they have come together with this petition, reaching nearly 132,000 signatures demanding that the Bank of England ceases to use animal fat in the production of currency. Even further on from this, local vegan businesses are starting to reject the new five pound notes as a form of resistance against animal cruelty and consumption. 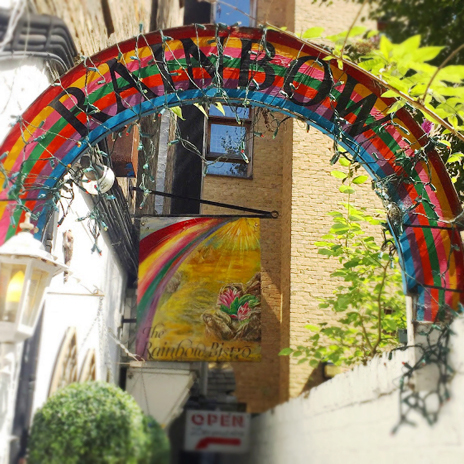 Rainbow Cafe, the vegetarian and vegan restaurant based in Cambridge, UK was one of the first. However, instead of turning away the £5 notes altogether, they are putting them in an envelope for donations towards Wood Green Animal Shelter. After the main press of Rainbow Cafe insinuated that they were full out rejecting the notes, the workers and the owners have received a lot of hate from both vegans/veggies and carnists (those who fully eat animal products). Another vegan restaurant is Voltaire, located in Bangor, Wales. They wrote on their FaceBook page “[...] We have decided not to accept the notes here at Voltaire as a stand against using animal products in our everyday necessary products. Thank you to all our wonderful customers who have been so supportive in our decision. We do hope that this does not cause too much inconvenience.” Rachel Phoenix, owner of Voltaire, even appeared on BBC Radio Wales to share her views and the reason behind her decision. You can listen to it here. Something else that hasn’t been spoken enough about within the vegan movement is the new £5’s effect on religious communities. As well as the oldest, The Shree Sanatan Mandir is also one of Leicester’s biggest Hindu temples. They have urged Hindus to not give the new £5 notes as donations once they found out it contains animal fat. The fact that the Tallow comes from a cow especially, is majorly offensive in regards to Hinduism. Cows are highly respected and sacred beings within Hinduism. Another religious community that is affected by the Bank of England’s absurd decision is the Sikh community. A Sikh activist, Jagdish Singh, has spoken on the issue and has said that it is extremely offensive to use this tallow in the new £5 note. The fact that the Bank of England didn’t even consider the communities that are repulsed, disgusted and truly offended by animal cruelty is shocking. However, considering the amount of lashback that has been received because of the presence of Tallow in the £5 notes, the Bank of England are treating the protests with “utmost respect” and are looking into a solution, with (hopefully) no harm to animals. So when you go on your first, fifth or hundredth date with your KaleDate match - make sure you bring plenty of coins, cash with old fivers, or your card! Solidarity to all those who have been affected by this new £5 note.